Life doesn’t stop just because you chose to pursue wellness. In fact, trying to maintain momentum during the busier times of life can often feel like the hardest part, right? Your wellness journey does not exist in a vacuum where you have ample energy, time, and resources to devote to your goal. Instead, you have to apply strategies to ensure that even on the longest days you aren’t defaulting back to where you began. One such strategy is to focus your efforts on the places that will do the most work. You could heave a giant boulder by pushing on it with all your might or you could use a pole and apply leverage. Which would you rather do after a long day? My guess is you’d prefer to use leverage. And today we’re going to talk about a huge way you can leverage your efforts for more effective action even in the midst of a full season. Because here’s the thing: If you wait until life “slows down” then you will likely never actually give your wellness the attention it needs…and you will end up on the burnout cycle over and over again. As a mom I have learned the importance of transitions – of helping my kids move from good morning snuggles to breakfast to getting ready to leave the house, etc. When I apply my energy to helping them transition I am helping them move on to the next portion of our day with purpose rather than an aimless wandering. I have to do the same for myself too. Without attention to the transition between putting the kids to bed and the rest of my evening, I end up scrolling on my phone instead of reading the book I was planning on. Routine comes in handy during transitions. As a routine becomes a habit it becomes automatic. My brain comes to expect it so I can skip over the “what should I do now?” and go right into my routine. All the actions that form my routine are grouped together – so instead of needing the willpower to do each individual thing, I complete a series of tasks. For instance, a routine you might already have is to check social media when you wake up. You don’t have to tell yourself to go from Instagram to Facebook to Twitter to Email. You follow the steps automatically. What if we used that to help you set a higher standard for your wellness on a day-to-day basis? The evening transition from work to home is a very important transition. If you work all day it is likely the only time you have to do things outside of your job. But how often does a long day lead to eating whatever is easy in the fridge, skipping the workout you intended, and sitting on the couch the rest of the evening? I know. Happens to me too. In fact it’s one of the phrases I hear tossed around the most whether online or in person. It’s hard to do more than stare at the wall or binge watch Netflix. Honestly? It’s so common we turn it into a verb and make jokes about it. To be clear, “valuable” is not working overtime on your couch. I actually mean carving out real time to do the things you say you want to do – like learning a new song on the guitar or coloring in one of those books you bought 6 months ago or finally having that girls night. Those activities are highly valuable for rejuvenating your mind and spirit. They serve to help you become the person you wish you were. So how, then, do you transition from work to evening? An effective transition routine is going to involve attention to three parts: your body, your mind, and your connections. Give your brain time to catch up – by zoning out. All throughout the day you were taking in new information and your brain was trying to process it. This includes how events or people made you feel and your personal thoughts on a new project or team member. At the end of the work day, your brain needs to catch up. The tendency however, is to fill space with a screen of some kind. This ramps up the stimulation – overloading the brain. You need to stare out the window or walk in circles around your yard – just don’t try to direct your thoughts anywhere. No meditating or focus. Just let your mind go. (this takes practice). Respond to physical needs: hydration, nutrient-dense foods, and restorative movement. Drinking water and eating a good meal – whether it’s a snack right when you get home or if you go right into dinner preparations – will revive your body. The lull you feel after work might seem like it requires a boost of caffeine or sugar but between letting your brain catch up and nourishing your body, you will experience a revival. Note: if you don’t, you actually might need a power nap. Restorative movement includes things like yoga, stretching, or a walk around the neighborhood. After a day of sitting it’s important to bring alignment back to your body and increase blood flow. Rigorous movement can serve an important purpose in expelling pent up emotion and stress. Rather than wasting energy mulling over workplace drama or social media posts do some sprints, a quick kettlebell routine, or hit a punching bag. Trust my experience – it feels amazing. And you’ll walk into your evening feelings more powerful and alert. A mental download can help you clear the slate from the day’s problems or worries. Perhaps after zoning out you realize you have a conflict you need to think through, verbal or written processing can help you determine a course of action and move on. Schedule (or eliminate) tasks that didn’t get accomplished today. Don’t let unfinished work hang over your head. It can lead to numbing behaviors or agitation toward others if it is allowed to go unchecked. Let this time also serve to redirect your focus. Is the task relevant to your priorities? Can it be saved for later? Can it be passed off? Why do you keep avoiding it? Can it be broken down into more actionable steps? Sorting through your list can save you time and energy later. Include any preset appointments, the big tasks you need to get done, and any self-care you plan to do (exercise, time with friends, etc). This is a must-do item. Having a plan for tomorrow is a major way you can keep the stress of today from carrying over into the morning. Re-establishing a connection with your own purpose and your important relationships is essential to recovering from stress. You are free to make decisions and spend your time in a way that aligns with who you really are and who you want to be when you are connected. Remind yourself that you aren’t alone by reaching out to a friend.This is more than fishing for encouraging words or compliments, it’s an opportunity to get a new perspective. It’s valuable to pick your head up and see what’s going on outside of your own life – beyond what someone chose to publish on Facebook for the day. Encourage someone else.Whether you write a note, send a text, or make a phone call, choose to be what you want others to be for you. Refuse to isolate yourself from the burdens of others and instead remind them that YOU are there for THEM. Because we’re all in this together. Making this YOURS involves experimentation. 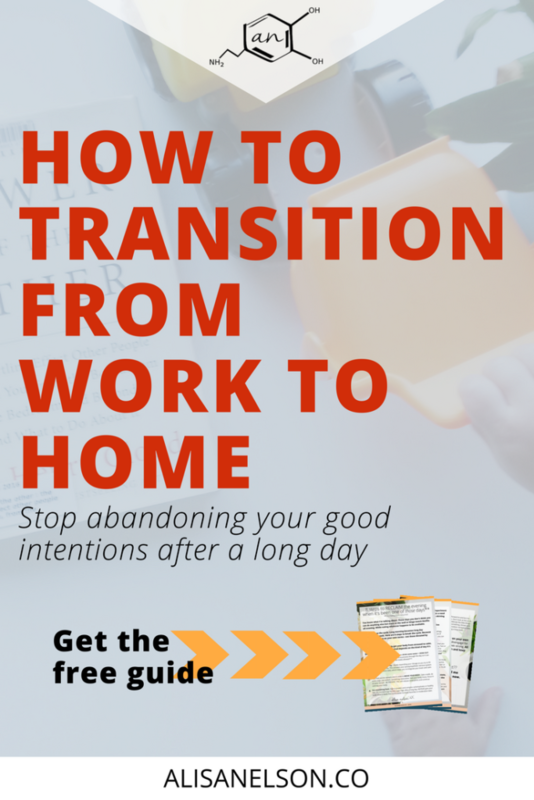 No need to try to do everything at once (or ever), as you get to know your own needs you will start to see what is most valuable in helping you transition from a long day at work to an intentional evening. The most important piece is that you refuse to accept a dud evening as normal. Might still happen occasionally (I recommend going to bed early then) but you can still raise your baseline. This isn’t a step away from grace for yourself after a long day, it actually shows greater self-love when you refuse to let the stress of today carry over into tomorrow. Click the image below to get this blog post in step-by-step format. You’ll also be signed up for the Lab Notes Community where we do things a little differently. 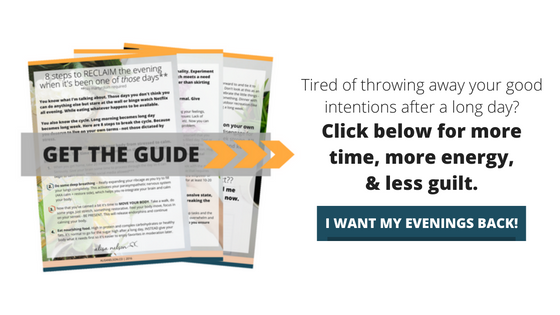 I’m not going to fill your inbox with fluff – we’re going to work together to move you toward your goals and shift you into action. Click below and get your first taste of survival mode freedom. So much good stuff here! Thank you!